If you believe in Valentine's day and to bloom your beloved then this collection of Valentine's gifts and hampers are sure to allure him or her to the core and charm heart away. Don't wait any longer, make your choice and order a valentine gift now. Valentine's Day represents a day when Lovers celebrate their love for each other. A Valentine day celebration is incomplete without gift exchange. 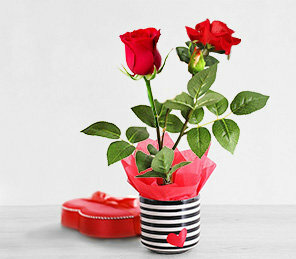 FlowerAura.com provides a wide range of Lovely Valentine Gifts for your loved ones. We provide a range which provides you variety in range of products and in terms of Prices which suit all pockets.